LANCASTER – Two men were arrested and multiple weapons were seized when teams of deputies served a search warrant April 16 at a Lake Los Angeles residence, authorities said. The bust happened around 7:30 p.m. Thursday, April 16, at a residence on the 40000 block of Fieldspring Street, according to Deputy Joshua Stamsek of the Lancaster Sheriff’s Station. “The search of the location revealed a .45 caliber semi-automatic pistol, a .45 caliber Commando Mark 45 semi-automatic (Tommy gun) rifle, and a .22 caliber rifle, two 20 gauge shotguns, along with miscellaneous ammunition,” Stamsek stated. Bryson Brooks, 27, was detained outside his residence with three other people, according to Stamsek. Brooks was arrested on suspicion of being a felon in control/possession of firearm, Stamsek added. The search warrant was executed by the Lancaster and Palmdale Operation Safe Streets teams, assisted by the Los Angeles County Probation Department. 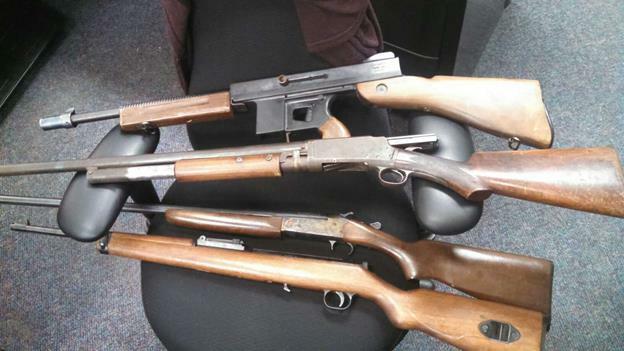 3 comments for "Weapons seized, 2 arrested in Lake Los Angeles raid"
so….. what was the raid for? …im pretty sure these are legal guns to own….”tommy gun? !’ ok … that makes it sound like theyre some al capone-ish mobsters . the guy probably said hed shoot them because he was pissed due to the fact they had no ligitimate reason to be there….